British age group athlete Russell Cox was in Bussleton at the weekend for Ironman Western Australia. Having taking a sabbatical from work for the past three months to live the triathlon lifestyle down under, he was hoping his hard work in training would pay off with a new personal best of nine hours and twenty minutes. And he managed it too, finishing in 9:20:22. Here is his report. 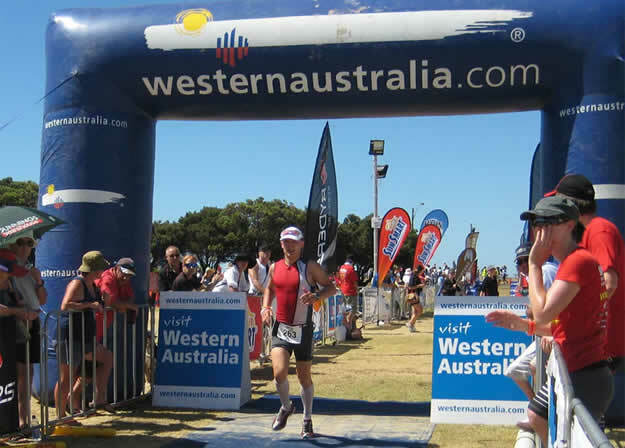 This year's Ironman Western Australia was always going to be a significant race for me. Having given up work and spent the last three months, making the most of the Gold Coast for training, it was going to be a test of all the hard work I'd put in. I'd had a good race here the previous year, but felt that given the nature of the course (flat, very flat) I should be able to do even better. I'd not gone as well as I hoped in Switzerland earlier this year so I was hungry for a new PB. From the time I arrived in Busselton I was pretty clear that 9:20 was my goal. A real step up, but at the same time a realistic target from the training I'd been doing. After watching the pros head off at 6am I had a very brief warm up just to make sure the wetsuit was comfortable. Everything was good, the waters were clear and calm and swimming felt easy. We were seeded by estimated swim time with blue caps right at the front. I have no idea what time I put on my entry form, but somehow I'd ended up with a white cap for the second group. Not that it's strictly enforced, but I'd secured a blue cap the day before so I could put myself up the front. A bold move given the Aussies are known for their swimming and for me it's still a work in progress! 6:15 and without a countdown the horn sounded. In typical Ironman fashion the first 10 minutes are spent trying not to get bashed too hard whilst keeping a good position. I managed to hold my own in the group and while I'd gone out quite hard I wasn't gasping for air. Eventually things settled down and I found a decent set of feet to follow. The swim at Western Australia is fantastic, really the highlight of the race. You have the jetty by your side to sight off and clear waters full of sea life. Rumours of sharks always circulate in race week, but the biggest danger is small stingers that sometimes drift in. Having had groups to draft off of the entire time I reached the beach not really knowing how things had gone. The swim felt too easy so I must have been going slowly! A quick check of the watch and I see a 58 with some seconds. Clearly I'd found the right group and had already put myself ahead of my schedule. I headed into transition feeling confident from a great start to my race. The bike course here is totally flat, there is nothing approaching a hill. Having ridden with the local squad I can tell you that you need to ride 30km before you reach anything like a climb. That said it has its own challenges most obviously in the form of the wind. 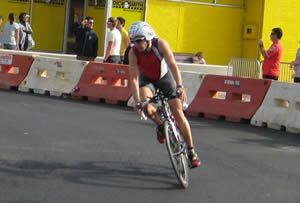 My aim for the bike was to work off heart rate keeping myself in a comfortable position to run well. At the same time I had a time goal of going under 5 hours so the trick was going to be balancing the two. Experience tells me I often go out too hard and fade a little later. Did that stop me? Yes and no, I went out harder than intended, but not to the extent I've done before. This was all about a measured effort to deliver an overall race result not just a great bike. Being quite well placed from the swim I soon moved up to one of the lead pace lines. I stuck near the back until the first turn around when I couldn't keep up and had to let them go. After the initial excitement and a fast first lap my pace slowed a little. I might just be the fatigue, but the wind seemed stronger and things got tougher. Each turnaround that pace line would taunt me by being just a few kilometres up the road. All I could do was keep working and focus on maintaining an effort that would set me up for my run. The third lap was not just physically tougher, but mentally too. By now I had no doubt the wind was stronger. I'd seen the course twice and the third time could only offer more work. It was tempting to let the mind drift, but I kept coming back to two figures on my bike computer: the average speed and my heart rate. The game was to keep the first one up and the second one down as much as best I could. I knew the average speed for a five hour bike and was comfortably over that. Keeping the average up would help build my buffer for the run so I kept working into the persistent headwinds. When I hit the town for the final time I eased back a little and stretched out. With almost five hours spent on the aerobars the body starts to stiffen up. The last thing I wanted was to carry any of that over into the run. Still ahead of target I was into transition off a 4:54 bike which got me out on the run under the 6 hour mark. I have no idea why, but for me the first few kilometres of Ironman marathons always feel great. So much that if I'm not careful I start to record silly split times which would put me on route for 2:45 marathons. My first Ironman taught me that wasn't likely to happen and since then I've learnt I need to hold back however good it feels. I'd set a run goal of a 3:10 marathon, again something I thought should be possible, but being cautious my plan allowed a ten minute buffer to the 9:20 goal. Each distance marker I'd check I was on pace. For the first 6km this mostly involved slowing myself down! Things settled in pretty quickly and I was careful to take on some nutrition at every aid station. I was pleased that despite no mention in the race booklet the Anzac biscuits were back. Anzacs soaked in coke are a favourite run delicacy. However I think providing Vegemite is an unfair advantage to the Aussies. Lap one was done on target, perhaps a little fast, but nothing I was worried about. Somewhere in lap two things started to get tougher, but I hadn't expected a 3:10 marathon to be easy. I kept pushing, but the real difficulty was keeping the stomach settled enough to take on food. I got through the lap relatively unscathed, but headed out on the third knowing that I was going to need some of that 10 minute buffer. With only 10km remaining I had roughly 50 minutes to hit my goal, should be easy I thought. With only 8Km to go I staggered into an aid station and walked it taking on everything offered to me. Somewhat optimistically I thought that would fix things and off I'd go. A few hundred metres down the road I decided a minute's walk break might help. I wanted to be strict about this and not waste too much time walking. I had 40 minutes for the 8km so I should be fine as long as I didn't spend it all walking. Miraculously when I started back running my legs seemed to be working again, it seemed I'd passed the worst of the low and got through it. I gingerly started to push the pace and make up some lost ground. By the time I had just 4km left I was really starting to move. There's something about knowing the finish line isn't that much further that really gets me moving. No more slowing for aid stations it was straight for that line. The fact it would all be over soon helped push the pain to the back of my mind. It must have worked as one spectator shouted I shouldn't make it look so easy! Believe me at this point easy was the last thing I considered it. Then there was the chute and much as I'd love to celebrate I had tunnel vision for the arch at the end. Once I was over it I could let the catchers worry about keeping me upright! I'd love to say that I was elated to have got my new PB, but to be honest I was mostly just relieved to have finished! It took a while to sink in, the whole plan and process of the race had been so clinical and until the lull in the run I'd felt entirely in control. The phrase 'train hard, race easy' had come up in conversation in previous days. I can't make any claim that the race was easy, but I'd trained hard and put myself in a position to deliver the race I wanted. I was extremely pleased to have got myself into the top 50 at an Ironman and the top 10 in my age group. Unfortunately not quite enough for a Hawaii slot. I leave Busselton feeling that the training is working and things can only progress from here on in. The next Ironman is Australia in April and the goal is to improve the age group placing and secure that Hawaii slot. I've spent two weeks in Busselton and have to say what a wonderful region it is to train in. The race itself is fantastic, the town gets behind it and really makes the event. The locals are incredibly friendly and went out of their way to support me in the build up to the race. I'm pretty sure I couldn't have performed as well as I did without their help, particularly Sue and Neil who provided me with a homestay whilst I was there. Also thanks to Jaggad (www.jaggad.com) as part of the Technical Development Team their kit is integral to my training and racing. They were present at the event and it was great to meet them for the first time. Getting to pretend to be a model for a few hours was an unexpected bonus too!